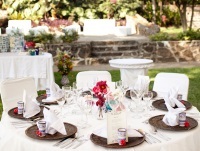 Valerya is a Certified Wedding Planner based in Morelia and specializes in destination weddings. She travels throughout Mexico to meet her client's needs. Her wedding service combines a professional experience with wedding design. "I have created the term Boutique Weddings to describe the weddings I love: petit and highly detailed weddings full of art and magic. Will you marry with me? I will be thrilled to be part of creating your dream wedding and offer you the best and wedding planning experience".